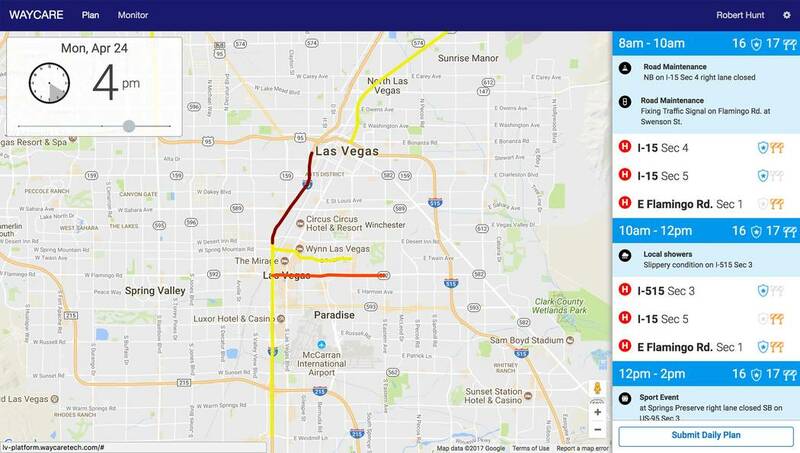 Local transit agencies plan to start testing by September a web-based computer program that will attempt to forecast accidents and gridlock on two of the busiest freeways in Las Vegas. A screen shot from the Waycare app highlights a segment of U.S. Highway 95 west of the Spaghetti Bowl in Las Vegas. Roadways with active maintenance projects display in this screen shot from the Waycare app. A screenshot of the Waycare app shows roads with traffic characteristics described as high risk. Most drivers only dream about the ability to predict vehicle crashes and traffic congestion. 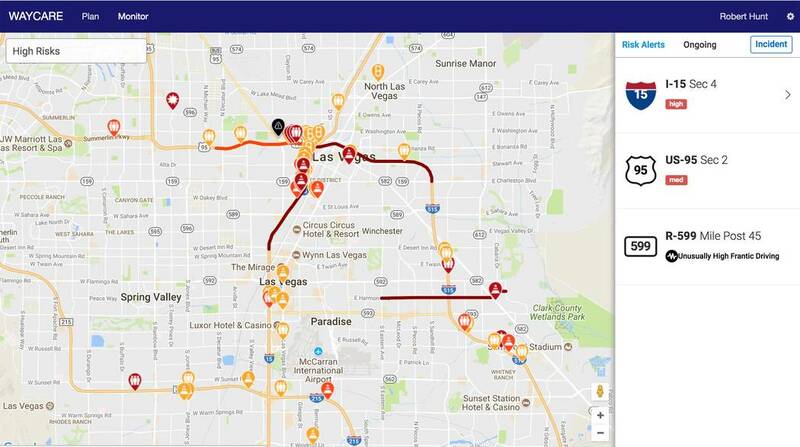 That capability could become reality by September, when local transit agencies start testing a web-based computer program that will attempt to forecast accidents and gridlock on two of the busiest freeways in Las Vegas. The Regional Transportation Commission of Southern Nevada will announce on Monday a partnership with Israeli startup Waycare, which developed the program to hasten response times for law enforcement agencies. “We saw this as an opportunity to use new technology to solve a problem that hasn’t been tackled in this way,” Waycare CEO Noam Maital said during a video conference call from Israel. 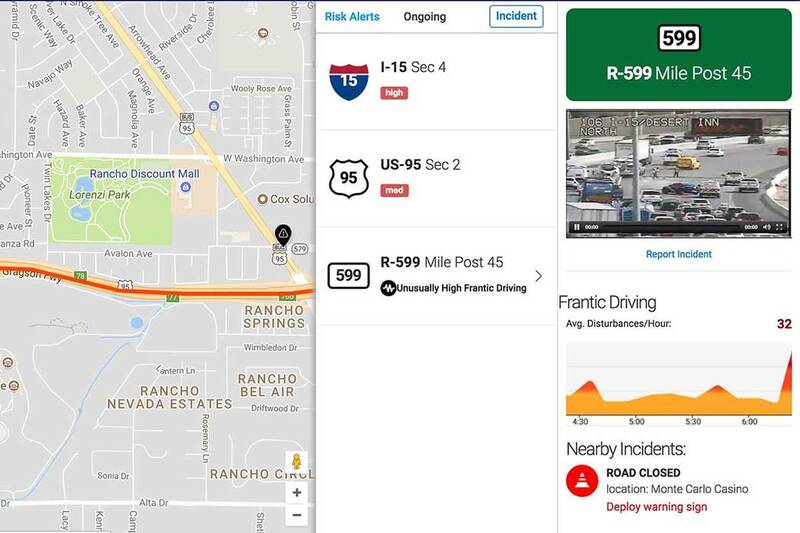 Waycare’s technology will be tested for six months as part of a $30,000 pilot program that will focus on traffic hurtling along U.S. Highway 95, just west of the Spaghetti Bowl freeway interchange, and along Interstate 15 south of Charleston Boulevard. For now, Southern Nevada’s traffic patterns are monitored by more than 600 cameras mounted on freeways and streets across the region, with live footage beamed to large television screens inside the RTC’s traffic management center. Waycare’s predictions rely on an algorithm that uses activity reported to the region’s traffic nerve center, along with archival information about previous crashes, construction activity, weather and other elements. The calculations can predict accidents and traffic jams up to two hours before they happen, Maital said. That anticipation could allow Nevada Highway Patrol troopers and the Nevada Department of Transportation’s roadside assistance crews to wait nearby in case a crash actually happens. The more often local transit agencies use Waycare, the more accurate and predictable the information becomes, Maital said. “The fusing of information will allow a lot of different data sources to connect more quickly and give us a fast description of what’s going on, allowing us to respond accordingly,” said Brian Hoeft, director of the RTC’s Freeway and Arterial System of Transportation, known as FAST. While Waycare was under development, Maital and his partners quietly tested the technology on Ayalon Highway, the busiest freeway in Tel Aviv. Las Vegas was the first city to agree to a citywide trial with Waycare. A second pilot program is expected to start in Tampa, Florida, by the end of the year. Maital said he wanted to test Waycare in Las Vegas because the city has a “unique combination” of more than 2 million residents and nearly 43 million tourists. “The information we get from Waycare will enable us to use our resources, including the Freeway Service Patrol, in a more efficient and strategic manner,” said Rudy Malfabon, director of the Nevada Department of Transportation.